Many people in Skagit and Whatcom counties spent their holiday weekends dealing with flooding, flooding and more flooding as rising temperatures melted snow and the rain just kept falling. Homeowners weren't the only ones affected. Our crews were out throughout the weekend to help clear water from roadways, remove fallen trees and to make sure the highways were safe for travelers. 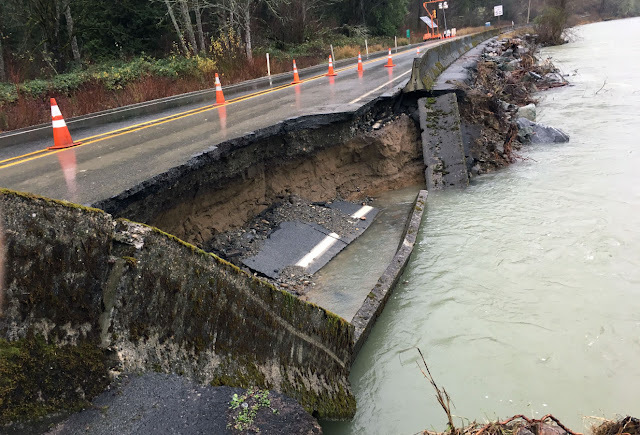 SR 20 at milepost 101 on Thanksgiving as flood waters from the Skagit River crested over the highway and concrete barrier. The hardest hit area for us was on SR 20 east of Rockport. 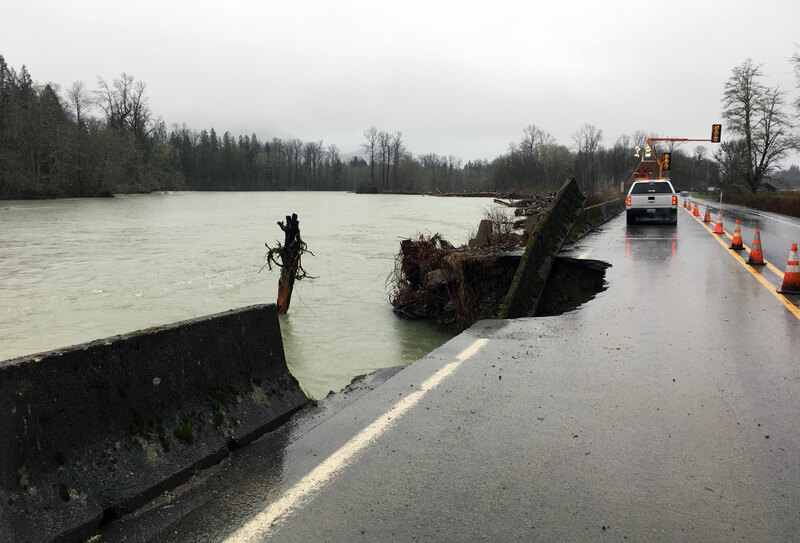 The high and rushing water in the Skagit River scoured out riprap along the bank, pulling material from under the road, collapsing part of the highway and sending traffic barriers into the water. We dispatched maintenance, construction and environmental crews to the site and they closed down the right (eastbound) lane, assessed safety concerns and worked to determine a fix. A temporary signal is alternating traffic through this area in the westbound lane. Our maintenance crews are on scene 24/7. Our Mount Vernon project office is working to get a contractor mobilized to the scene. moved nearly 100 yards of additional bank material that will need to be built back up. This area was rebuilt about 20 years ago to protect the highway. The contractor is expected to take over the site from our maintenance team Tuesday night. On Wednesday they will start work to replace washed-out riprap and repair the road. Crews will work daylight hours, 7:30 a.m. until 4:30 p.m. Wednesday through Sunday, Dec. 3 this week. Crews hope to wrap up this work before Christmas. wasn't included in that 2014 project because it was stable at that time. Why is it going to take so long? We don't have a precise measurement of how deep or wide the scoured area is so the amount of material needed is still unknown. It will take time to place each rock where it's needed in the scour hole. The weather is also not on our side and this is work that needs to be done in the daylight, which there isn't a lot of this time of year. This is also a remote location and getting the needed material here will take time. Didn't you just do a project here? We did a project in 2014 downstream from this area. 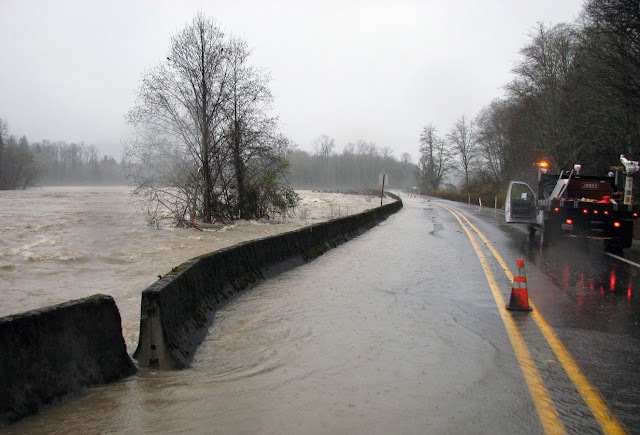 The river was threatening the road so we received emergency federal funds to protect the highway. Well, why didn't you just protect this area then? This neighboring area was stable during the 2014 project. We received emergency federal funds for that project and couldn't spend money on an area that wasn't directly impacted at that time. Our traffic counts for this stretch of road are determined during the peak season (when the North Cascades Highway is open across the mountains). During that time, 2,200 vehicles used this stretch each day. What sort of delays should I expect if I live in the area? Crews will be using the washed-out lane as a work zone, leaving one lane to be shared by both eastbound and westbound travelers. Those who need to travel through this section should expect up to 30 minutes of delay daily between 7:30 a.m. and 4:30 p.m. Flaggers will be on scene alternating traffic through the area and, for everyone's safety, will hold traffic on both sides during certain work. Delays outside of those times should be less, depending on traffic volumes, as you'll just need to wait for the traffic light to cycle through. How are crews planning to fix it? Crews will replace the riprap the river washed away. They will start by placing 6-foot diameter rocks in the water until the underwater area/bank is built back up. Once they've got those placed, they will add smaller rocks behind and atop that - and so on - until all the riprap that was there is replaced. They will then rebuild the road over that washed out stretch, put asphalt down and redo striping – work that is weather dependent. How long will that fix last? That depends on the river. Geologists believe the event that scoured this section was part of a 5-year-flood. This section was last repaired in a similar manner about 20 years ago, which gives some indication of how long this repair should last. We will be looking at ways, and funding, to keep this area from being scoured in the future. That said, Mother Nature and this river is more powerful and doesn't always do what is expected. We are in the process of requesting federal emergency funding for this repair. Costs right now are being paid through state dollars. View more photos of Thanksgiving flooding on the Flickr album.